This year's Coldwell Banker Awards celebration at the world famous Broadmoor Hotel in Colorado Springs was absolutely amazing! I am so incredibly humbled and honored to be named a 2017 recipient of Coldwell Banker's International Sterling Society. In order to qualify for International Sterling Society, all recipients must achieve at least 18 Units or $120,000 ranked by award GCI. This small group of individuals represents the Top 14% of all Coldwell Banker NRT Associates Nationwide. Thank you so much to Chris Mygatt, President of Coldwell Banker Colorado and Kevin Risen, Executive Vice President, for an incredible honor! Most of all, thank you to all of my clients who allow me to represent them in their real estate transactions. I am so happy to call each of you dear friends and am extremely appreciative of the opportunity to serve you! Denver, Colo. – February 24, 2018 – Dan DeBacco of Coldwell Banker Residential Brokerage’s Devonshire office has been awarded membership in the Coldwell Banker International Sterling Society, an honor bestowed upon the top Coldwell Banker Residential Brokerage sales associates nationwide. 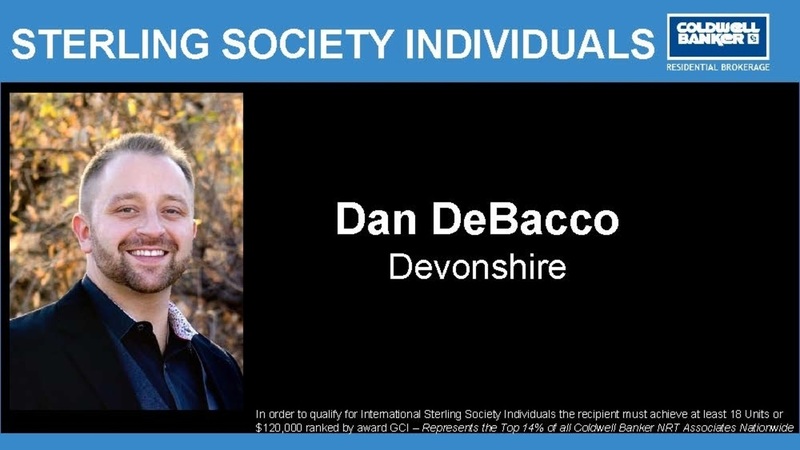 Winning the distinguished and highly sought after Rising Star Award last year, Dan DeBacco is complemented and respected as a top real estate professional with Coldwell Banker here in Colorado. His dedication to not only his clientele, but his utmost passion for the betterment of his community is radically contagious and he deserves every ounce of recognition that has been bestowed upon him. Coldwell Banker Residential Brokerage’s Devonshire office is located at 201 Columbine Street, Suite 200, Denver, CO 80206 and can be reached at (303) 758-7611. Dan DeBacco may be reached directly at (720) 955-6111 or dan.debacco@coloradohomes.com. Coldwell Banker Residential Brokerage, a leading residential real estate brokerage company in Colorado, operates 16 offices with nearly 1,000 sales associates serving the communities along Colorado’s Front Range. The company offers residential and commercial brokerage, corporate relocation and mortgage services. Through its internationally renowned Coldwell Banker Previews® program, Coldwell Banker is widely recognized for its expertise in the luxury housing market. Coldwell Banker Residential Brokerage is part of NRT LLC, the nation’s largest residential real estate brokerage company. NRT has 725 offices and 41,500 sales associates operating in more than 35 major metropolitan areas. A subsidiary of Realogy Holdings Corp. (NYSE: RLGY), NRT operates Realogy’s company-owned real estate brokerage offices. For more information please visit www.coloradohomes.com or call 303.880.5020.